If you are an iPhone user and a cyclist then the new waterproof and shockproof BioLogic bike mount iPhone dock from Dahon may well appeal. It is, arguably, the ideal satellite navigation device for the well-equipped cyclist about town! You could also, if you were less inclined to take sufficient care of yourself (or other road users) even watch YouTube on the go. But don't. Seriously. Please don't! 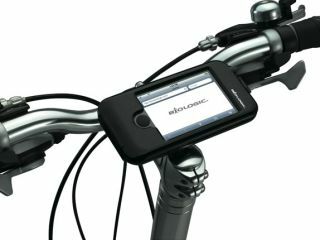 Dahon's BioLogic iPhone case lets you pop your iPhone on your handlebars, safe in the knowledge that you won't smash it or that it won't be destroyed in the rain as you cycle to work. The new iPhone cycle case also features a 360-degree swivel and is out in the US in January priced $60. TechRadar has spoken with the company's UK distributor and we are awaiting further details on UK pricing and availability. If you also invest in a Dahon iPhone ReeCharge system, which powers up your iPhone from your bike's generator hub, you could even charge your phone as you enjoy your daily cycle!